Few days ago, we have reported that some guys overcharged by Apple on purchase of Mac OS X Lion due to an unknown bug in iTunes or Paypal system. But now it is reported that Apple has start began refunding the users who overcharged by the bug. Last week we have also reported about a user who overcharged by Apple 122 times on purchasing Mac OS X Lion that costs him $4,000. 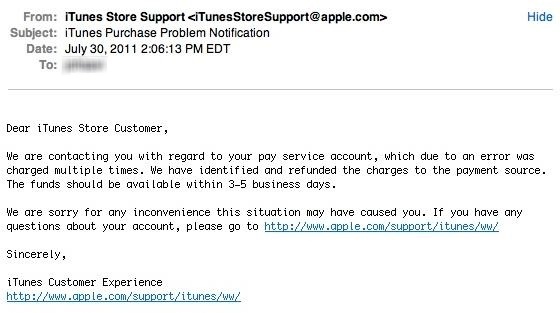 As we have told you that they paying back, so if you are one of those users who overcharged on purchase of OS X Lion, you will soon see the exact email, which was published by the folks over MacRumors. Apple kept me on a very need-to-know basis all along, but once I confirmed the money was in my PayPal account, he then asked for a list of fees to review. Once he saw the fees (very minimal), he offered to pay them and give me a bit extra to pay any additional fees I incur.